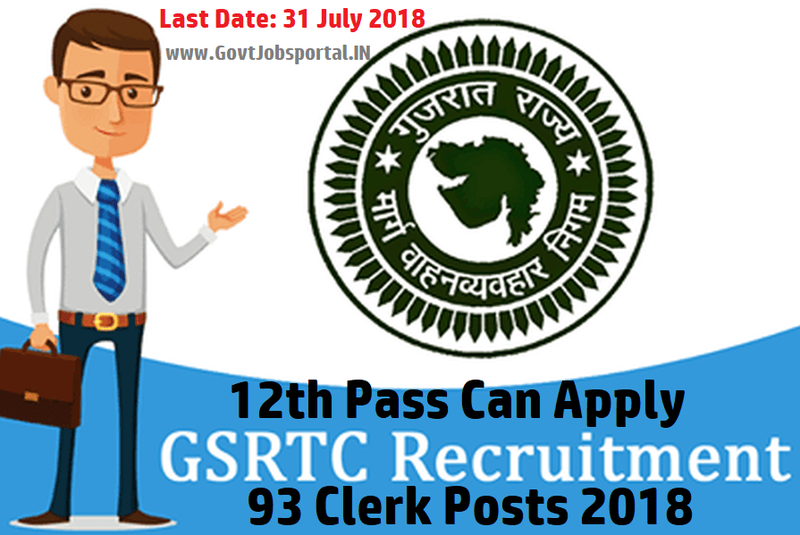 Latest Government jobs in Gujarat state through OJAS GSRTC Recruitment process 2018. Online Government job applications are invited from GSRTC Recruitment department for filling up the vacant positions of clerk. All Indian candidates who are wishing to sever the Government of Gujarat can apply for this GSRTC online recruitment process 2018. OJAS GSRTC department said that they are going to fill up the 93 total vacant posts of clerk through this GSRTC online recruitment process 2018. The process for accepting the online application for these Government jobs in Gujarat is activated now, so those who are wishing to apply can use the online mode for this GSRTC Recruitment 2018. The link for accepting online application will stay alive up to to 31st July 2018. So all the interested candidates for these Government jobs as a clerk have to apply before the end date. More information related to this OJAS GSRTC Recruitment process is given below in various section. Check the complete article carefully before applying online. Pay: Rs.10,000 + Other Benefits Per Month. Education: Indian candidates who are wishing to serve the Government of Gujarat must have passed in their 12th class examination in any stream from a well-recognized education board of India. Age Bond: Applicants age must have in between following age figure: 18 years to 33 years. Candidates who lies in between this age limit can apply for this GSRTC Recruitment 2018. What Application Fee to be paid for applying these Government jobs? All Indian candidates have to pay the same examination fee of Rs.250 for applying this OJAS GSRTC recruitment process 2018. Candidates can use online mode such as Debit card, Credit cards and Net banking for apying the application fee online. There is no other mode for paying the application fee for this recruitment process. What is the procedure for applying this OJAS GSRTC Recruitment? Candidates who full fill all the eligibility criteria such as educational criteria and age limit which we explained above in this post, can apply for these Government job through online process only. You have to follow the official website for online application. Under the IMPORTANT LINKS below we also share the reference links related to this notification. The notification advertisement is in Gujarati language only. 1st July 2018 is the Starting Date for applying online. 31st July 2018 is the Last Date for online application.